Scheveningen is not a name that is likely to be familiar to the majority of people. A brief search suggests that it is a subdistrict of The Hague, which advertises itself as 'Holland's most famous seaside resort' with a 'fascinating marine world at Sea Life'. More pertinent to this article is that it also hosts The Hague Open each year, a clay court Challenger event. The Challenger Tour is far from the glamour of the likes of Wimbledon and generally consists of a collection of up-and-coming youngsters and journeymen players. It was in this tournament this lunchtime that two of the members of Kazakhstan's overachieving Davis Cup team met in the first round, fresh off the plane from their agonising 3-2 defeat in Darwin. Fourth seed, Aleksandr Nedovyesov, was drawn to play Andrey Golubev, who he had played doubles with in Australia mere days ago. As the odds below show, the bookmakers were unable to separate them and had it priced as a perfect 50-50 match. Andrey Golubev came out of the blocks quickly and dominated the first set, winning it 6-2. So far, there appeared to be nothing suspicious about this match. At the end of the first set, Golubev was around 1.23 and Nedovyesov was around 4.0 (thanks to @ahunnbet and @dougalltennis for these prices). This is more or less perfectly in line with where we would expect the prices to be at this stage. Bizarrely, not only has Nedovyesov shortened, he is actually now the favourite for the match. 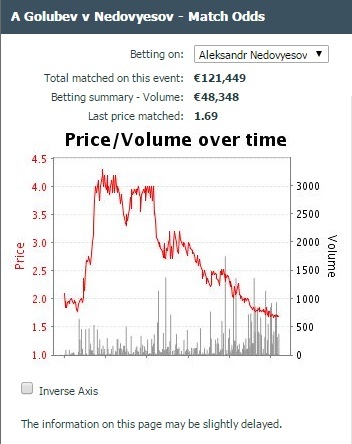 We can see that the most recent price matched on Nedovyesov was 1.69, which signifies an implied probability of 57.2% to win the match. Now, given that his starting price of 1.91 with Pinnacle gave him a 52.4% probability of winning, it seems rather peculiar that he was apparently more likely to win the match at 2-6, 3-3 down than he was at the start. Now, you do sometimes see markets like this if there are injury doubts about a player and a retirement is expected. Given that Betfair pays out on the winner via retirement if the first set has been completed, you can often see injured players drift right out, but it is difficult to see any indication of this. There was no MTO and there was no indication of any injury according to those watching the match. Indeed, given that Golubev had held to love in four consecutive service games at this stage, it seemed as though he was not struggling at all. However, that just seems to leave the conclusion that someone betting on the match on Betfair knew what was going to happen in the match. Going into the second set TB, Andrey Golubev had still only dropped one point on serve in the entire second set. Despite that though, he was priced at 3.0 to win the tiebreak with Bet365 and 1.61 to win the match. Three sloppy unforced errors and a double fault later, he was 0-4 down in the TB. He pulled it back to 2-4, but the market had no faith in him by this stage. Nedovyesov had fallen right down to 1.27 to win the match or 78.7%. Quite impressive for a player that was only around 50% at the start of the match to be almost 30% more likely to win the match down a set and up just one mini-break in the TB. As scripted, Aleksandr Nedovyesov won the second set TB 7-2 and by this stage, the market knew precisely where this match was headed. Priced at just 1.17 for the match or 85.5%, there seemed little doubt who was winning this match. Still, there was no sign of any injury concern that might be about to cause an imminent retirement and no momentum effect would cause that sort of price move. If a player is rated at a 50% chance to win a match, it follows that he must be 50% to win a single set. There could be an argument that with the momentum of having won the second set, Nedovyesov might have been a slight favourite in the deciding set, but certainly not an 85.5% favourite. To the surprise of nobody that was following the match, Aleksandr Nedovyesov broke early in the third set dropping to 1.07 immediately following the break and then just a steady decent to 1.01. Now, there will be the usual arguments that there was an injury or that it is simply the complaints of bitter gamblers on the internet that lost money. However, the reality is that virtually all of the major bookmakers stopped taking bets on this match during the later part of the second set and a number of them have reported the match to the TIU, showing that it is not only the gamblers that are suspicious of this match. Their match in Aix two months ago went exactly the same, 4-6 6-4 6-3 Golubev. Golubev traded lower at 3-3 in the second set than pre-match. Whatever argument you might want to make to explain today's match as a one-off, it becomes far more difficult to make that argument twice for the same pair of players. If two matches between the same two players show almost identical suspicious odds movements, surely this must be a huge red flag? The link below shows the full match. 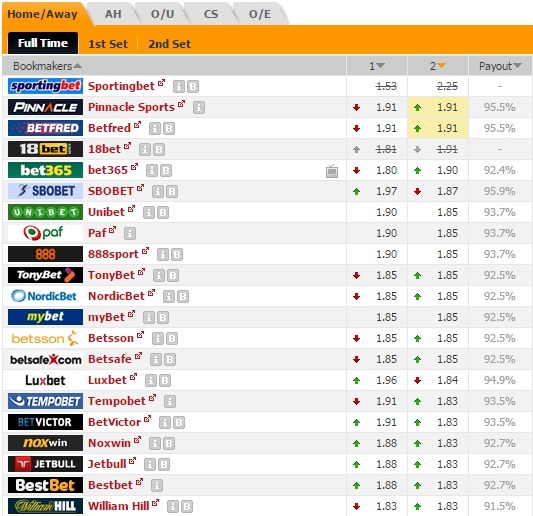 Now that we have seen the suspicious odds movements, you can watch the match and see whether you can see anything to indicate why the odds should have moved as they did. Saying this is getting repetitive, but as with both the Meersbusch and the Dallas matches in the past twelve months, it is likely that nothing more will be heard of this match. The notoriously secretive TIU does not release any information beyond ban announcements, so we should not expect to hear anything. All we can do is flag up these matches and hope that eventually the weight of evidence will force action to be taken. Once again, I will finish with a quote from my last article on this subject. It is as relevant now as it was six months ago. There have been some good articles written by the mainstream tennis media recently addressing the match fixing issue, but this start cannot be allowed to just peter out. The authorities need to target those players and associates that are involved in match fixing. And if the authorities are not going to do it, it needs journalists to question those in authority. We saw in cycling how it was journalists that eventually blew the lid on the Lance Armstrong doping situation. Is there a serious respected tennis journalist that is willing to ask the right questions to the right people? Definitely a fixed match, was also mentioned in other forums. Hope these two players will be banned for a while. More obvious you can't fix. The market knew in advance what will happen. Beside the tiebreak was quite obvious. Golubev made 2-3 errors on purpose. Clearly fixed, but it only takes one player to throw a match. In this case, it was Golubev. also the 2nd point on the tie break was a great return by nedovyesov, both players were going for the point..
im not suggesting anything, but if somebody paid me 100,000$+ to fix a match, I wouldnt risk a tie break while being a set up, especially when the odds started changing @ 3-3 in the second. The longer the second set is close, the longer the price holds up for those betting the fixed player. The price of a player at 3-3 is going to be better than if he is leading the 2nd set 0-4.